It’s another sleepless night. The anxiety that our vacation time alone is coming to a close is kicking in. Being away from everyone and everything we know has been an escape from the harsh and hellish reality that has become our lives. The constant reminders aren’t everywhere here. And as much as I am looking forward to being with our Ontario family, the thought of landing face first into the brick wall of reality on Wednesday is weighing on me like a corpse. I wrote on twitter last night that despite being in the happiest place on earth I still overwhelmingly heart sick. I am broken. I got a bunch of lovely and much appreciated replies that I am not broken and that time will heal all wounds. With all due respect to those people (whom I love and appreciate dearly), you have never lost a child. And I hope you never do. I hope no one ever has to feel this amount of pain and anguish. But until you know this pain you can’t possibly understand how broken I am. I really, truly am broken. No passage of time will ever make me hurt less. I may learn to live with it, but I will never ever hurt less for my daughter. She was, and remains, everything I ever wanted out of life. I am broken without her. Even a brother or sister will never replace her, nor will it ever heal my hurt for her loss. As skeptical as I was (and remain) about this trip, the sunshine and anonymity has been good for me. The reminders are Constantly there, Everlee is always on my mind (just last night we went to Hooters, of all places, for dinner and our waitress was pregnant. I was anxious for her the entire time, wondering if she was ok being on her feet serving us. I hope her and her baby are happy and healthy). I’ve been able to breathe for awhile. Ive laughed without hating myself instantly, Ive gotten some sleep. But it can’t last forever. One last day awaits in the magic kingdom today, then tomorrow we head back north and back to our awaiting future, without Everlee. These last two and a half months have been absolute and utter hell. No one should ever have to lose a child. No one. And I’m not going to pretend that being here in the happiest place on earth has eased that pain even the tiniest bit. But if we had to learn to start over again, I’m glad we chose to do it here. There’s magic and hope at the turn of every corner and it gives me a little bit of hope that maybe, just maybe, I will be able to be happy again some day. They say this is the place where wishes come true, and all I wish for is to find peace again. There’s something to be said about being cut off from the world completely for a week. This post will be scattered and disjointed, much like my brain. So please try to keep up. The cruise was really great. A new adventure every day and something exciting always right around the corner. Waking up in a new place every morning. It was a week of much needed distraction, sunshine and adventure. I had fun. I even slept a little. But it wasn’t without its challenges. There were over 700 children on the ship. A lot of small babies. It made my heart ache. The first night in the dining room we got seated with a couple who were MAJOR religious folks, and when we told them about Everlee (they asked if we had kids) they told us they too had lost a baby they droned on and on about how it was God’s will and that we might not understand, but god does. Then the other couple we were with were 20 weeks pregnant. It was just not a good night. We moved tables the next day and got seated with two lovely couples around our age. It was a rough start. The comments about how nice I looked and how great it was to see me smile made me feel awful. I have no idea why. I guess I just feel like I’m betraying Everlee somehow. Like I shouldn’t be allowed to smile yet. I miss her so much. But it’s nice to have the anonymity here. The anxiety has eased a little around crowds knowing that not everyone sees my dead little girl when they look at me here, but now thinking of going back makes me ill. In Jamaica I found a tanzanite necklace and earrings set that I absolutely loved. Darcy bought them for me for Mother’s Day, from Everlee. I cried so hard. I will cherish them forever. Today began another ten days in Orlando. We went to Island of Adventure in Universal. It was fun. I went on my first big girl roller coaster and survived, and drank some butter beer at Hogwarts in the wizard inn world of Harry Potter. I’m trying very hard to put one foot in front of the other each day bravely, but I still wake up every morning not wanting to get out of bed, and cry myself to sleep every night. I’m having moments of happiness during the day, but more than anything I’d give up this entire trip for just one half a second to hold Everlee again. It’s amazing to me how each minute without Everlee has continued to drag on and feel like an eternity, but the days and months have flown by. Today, she would have been two months old. Instead of snuggling her late at night, I’m sitting on a sunny balcony in Florida relaxing after a morning of shopping (postpartum shopping is depressing). I’ve had a great week. Not happy, but peaceful. Rejuvenating. I’ve been able to relax and not worry about judging eyes, but there is never a second she’s not on my mind. 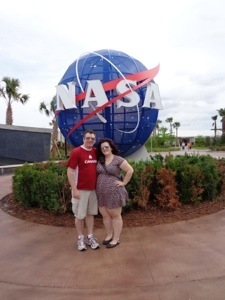 We went to the Kennedy Space Centre yesterday and I just wish Darcy was able to share his excitement for the place with her. Everything I see and do I just wish more and more that she was here with me so that I could show her the world and experience things through her eyes. I didn’t anticipate how hard it would be to see families with their little girls here. But I wasn’t thinking about that when we booked this trip. It’s bearable, but it’s just one more reminder. We went down to the hot tub last night and met a number of different people and I was asked for the first time if we had kids. I was instantly sick to my stomach. I knew I’d get the question eventually. I was preparing myself for it. But the instant knot in my stomach. I don’t think I could ever describe it. I simply answered (choked) that we had one daughter, but she passed away. The woman said she was sorry for our loss and that was that. But it hung in the air over my head for a long time afterwards. This will be my answer to that question for a long time to come. I wonder if it will ever get any easier? We leave on our cruise tomorrow morning, so I will be in radio silence for the next week. I’m hoping that the new experience will bring some happiness and some genuine smiles, big at the very least I hope I will continue to relax and maybe get a little more sleep if I’m lucky. In the meantime, happy two month birthday to my beautiful baby girl. I live very moment for you now. Mommy loves you, Everlee. II’m sitting up in bed with knots in my stomach. My bags are packed and double checked. Extra outfits in my carry on and all idevices are charged and ready to go. But I still have that sick feeling in the pit of my stomach like I’m forgetting something. I’m not a nervous traveller by any stretch. I’m not stranger to airports and long flights, nor is Darcy, but this feels so different. All I’ve wanted is for this vacation (I still hate that word) to be is an escape for me and Darcy to be able to start to put our lives back together. All I want is to be able to walk into a room, for just a little while, and not have people look at me and think “there’s the girl with the dead baby”. I want for us to have time for ourselves to rediscover what life is all about for us now. But then there’s the pressure. That nagging voice in the back of my head. I’m starting to feel like people are expecting it to be a magic potion to fix everything. Maybe that’s an expectation that my mind has fabricated (as it tends to do), but it’s one I feel, none the less. I’m not going to come back and be “fixed”. This is who I am now. I am a childless mother. And for the rest of my life I will think of Everlee every single day and miss her, and grieve for her. I just need to learn how to live with that, and I hope this will be the beginning of this process. The anger is starting to slowly seep in. Not in the way I expected it. In glancing through my Facebook feed tonight I was sorely reminded of how some people simply don’t appreciate all that has come to them so easily. A lot of people take for granted what I so desperately wanted and lost. Everlee was everything I ever wanted and never thought I would ever get to have, and I only got to keep her for an instant. Please, cherish every moment with your children while you can, don’t take for granted the gift you’ve been given. I’d gladly and without a hesitation give every day of this trip for just one second with my little girl again. I know what I feel l Ike I’m forgetting. I’ve known for weeks in preparing for this trip. It breaks my heart that I’m leaving my little baby girl behind. Even if she isn’t still here, the mother in me, the mother that I am, feels like I am leaving my baby for the first time. The knot in my stomach is a mother’s anguish. A mother’s guilt. But I guess that will never go away. Bon voyage for now. I don’t know if I’ll update this blog from my travels. Part of me wants to completely disconnect for awhile. The other part of me knows that this blog has become my release and my only true outlet to rawly articulate myself in the most honest way I know how. I guess, like everything in my life, I’ll just take it one day at a time. I so desperately want to write something tonight. I’ve been sitting here looking at a blank screen for what seems like hours listening to the wind howling outside and I can hear the faint sounds of the TV from the basement where Darcy is. But the screen has remained empty for the majority of that time. Much like me. Another stage of mourning I suppose, but I feel just so used up. So empty and worthless. Not in a pity-party kind of way, but in a deeply tired in my soul way. Like a used tin can; contents emptied, can tossed aside. Of no use anymore. These past few days have been particularly hard for no real evident reason, aside from the obvious. I’ve found myself wanting more and more to crawl into bed and cry for hours on end. My nights are still plagued with sleeplessness. I haven’t gotten more than two hours sleep in a row since Everlee died. I rarely sleep more than 3 hours a night. It’s really doing a number on my body, and it gives my mind no time to relax. It’s hard, on top of everything else that is already so incredibly hard. Today we started looking at headstones. I kept a brave face (I’m getting much better at swallowing my tears) but it was honestly one of the hardest things I’ve done in this whole process that has become my life. This will most likely be the last thing I ever buy for Everlee. The last thing I can really do for her. It will be her marker in the world. It’s how people will know she was here and that she was loved. How do I pick something like that? How do I commemorate the death of the dreams – first steps, words, days of school, riding a bike, learning how to swim and fish? How do I not only adequately mark the loss of our daughter, but a grandchild, a niece (by blood and love), a childhood friend for my friend’s children? How do I mark the loss of all of her potential and not just 34 weeks? I thought Darcy and I would pick out a headstone today, I really wanted to get it done before we escaped for awhile, but when we got there I was just flooded with all of that reality. This isn’t unfinished business to be dealt with. It’s a memorial to everything she was and could have been. I can’t rush that. Her headstone will be simple, but I want it to be perfect, just like her. It’s worth that time. And for the first time I feel angry and jealous. I should be picking out dresses and hair bows. Instead I’m picking out headstones. Can you see that my baby is dead? In this new life I am living, I go out into the world everyday and do my “supposed to’s”. I’ve resolved to get out of bed every morning (well mostly every morning, some mornings I just can’t), get showered and dressed and face the day. I try to accomplish something every day, despite the anxiety and the crushing grief, I face the day. Sometimes I stop in my tracks because reality hits me like a ton of bricks. I’ll see a mother with her children, or a pregnant lady at the store. Sometimes I’ll just remember something that happened the night I was in labour but had completely forgotten. Like today, out of no where I remembered that I had thrown up twice overnight while I was in labour. I have no idea why I remembered that, but the reality of it slapped me across the cheek and I can still feel the sting. But everywhere I go there is this background music in my head, every conversation I have I hear it, every person I am with, I wonder do they know? It never stops. I look like I just had a baby. I have that telltale pooch in my tummy (not to mention my massive chest). I’ve never been one to feel particularly comfortable in my body. Truth be told, I have hated my body my whole life. I have always suffered from somewhat low self esteem when it comes to my physical appearance. I’ve never felt beautiful, not even pretty. 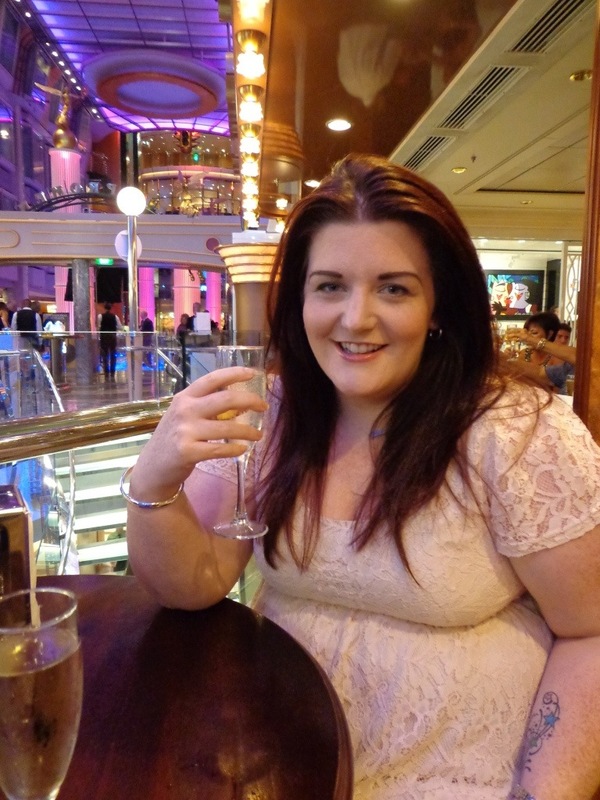 I’ve almost always been overweight, save for the year before I became pregnant when I had actually lost enough weight to finally feel comfortable in my own skin. And now my body, my physical appearance, serves as a constant reminder of losing my daughter. I lost her and I lost all of the hard work I put into trying to accept my body again. Now when I look in the mirror all I see is failure and self loathing. One of the things I am struggling with quite a bit now is the loss of who I was before Everlee died. I look at pictures of myself taken in the days and weeks before we lost her and I don’t even recognize that person. There’s one in particular that haunts me. A picture taken at Christmas, about six weeks before Everlee died. We were in front of the christmas tree and in the picture I am laughing. I am looking somewhere just beyond the camera lens. I look at this picture over and over. The woman I see there is content. I see her, smiling and confident, and feel an odd sense of detachment. I stare into my own eyes looking for clues- clues to what I’m not really sure; maybe some foreshadowing of the nightmare that will shortly begin, maybe some answer to how I will continue to survive. I envy her, but also pity her- she has no idea what’s coming.